The previous iPhone 6 box we saw proved to be fake but here's something that may be more plausible. What you see here is a small card that allegedly will come inside the new iPhone boxes – it serves as a sort of manual for the iPhone. The card shows a diagram of all buttons on the Apple iPhone 6, including the Power button that was moved to the side (to be easier to reach after the increase in screen size). The Touch ID home key is still in place as is the Lightning connector. 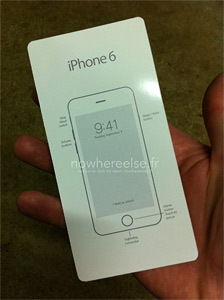 Alleged photo of the Apple iPhone 6 box. The card doesn't mention screen dimensions or the rumored 128GB storage option. Note the date shown on the screen – September 9 – the alleged launch date of the next iPhone. 9:41 seems a bit early for the actual announcement but Apple hasn't sent out invites yet so we don't know when the even starts.